This novel paper, cheekily denoted as a ‘closet paper’ by its designer, William Justema, was produced in the 1940s for innovative New York wallpaper merchants Katzenbach & Warren. On these pages from a 1948 sample book, bleached bones are printed on a foggy bluish gray ground. The skeletons appear to be having a grand old time doing flips, showing off their finest dance moves and lounging about. Justema was a wonderfully diverse character. In a 1984 interview he listed his occupations as having been “actor, painter, writer, soldier, monk, [and] teacher.” As a teenager he acted as muse and creative collaborator to photographer Margrethe Mathers, and perhaps her famous image of him, ‘Billy Justema in a Kimono’ can be seen as representative of the intimate connection Justema would have with pattern throughout his career. He spent forty years as a wallpaper and textile designer, authored several books about the history of pattern, and even consulted on camouflage techniques during World War II. When it came to novelty papers, he believed that the pattern should encourage “amiable conversation” rather than “downright consternation.” He saw many of his midcentury contemporaries designing wallcoverings that were effective in shop displays, but would in all likelihood cause “the family [to] get mighty sick of [seeing] them in the breakfast nook every morning.” Justema’s more nuanced approach to novelty can be seen in the execution of ‘Skeletons.’ The premise at first sounds a bit spooky for regular domestic use, but the comic and cheerful poses of the boney brethren remove any potential for scariness, leaving one with the pleasant musing that benevolent ghosts are guarding the coat closet. 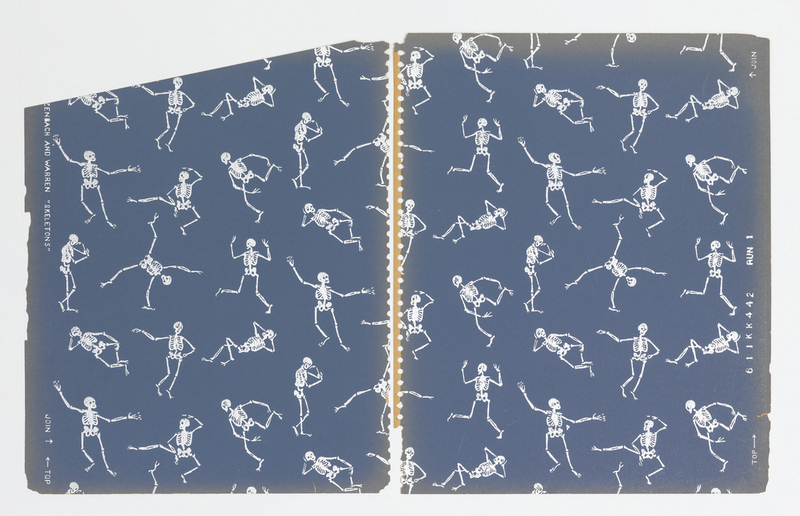 Sidewall - Sample, Skeletons, 1948. screen-printed on paper. Gift of Katzenbach and Warren, Inc.. 1949-46-1-15.